Situated in a quiet courtyard off Somerset Road, you will find the Queen Victoria Hotel by looking for their logo on the door. 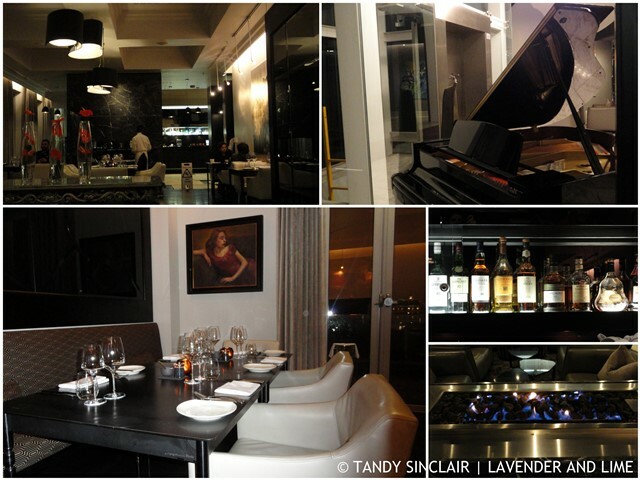 After parking the car, Dave and I made our way into the 34 room boutique hotel, past the piano player into the restaurant. Dash restaurant seats 34 diners and is beautifully appointed with a view over the Waterfront. The tables are steel and therefore cold but thankfully the plates arrive hot. Cutlery, glassware and crockery is of a high quality as one would expect from a five star hotel. The wine is not cheap, nor outrageous, and there is a good selection. 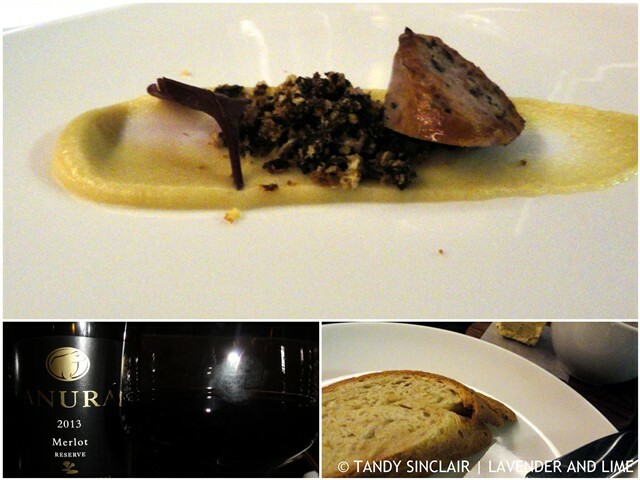 The Anura Merlot is a house wine, priced per the glass at R40. We had a bottle of this 2013 red. I can instantly smell black berries and there is a hint of chocolate on the finish. Phindiwe was our waitress for the evening. She is very friendly, giving us her recommendations for our meal. The wait staff take ownership of the menu, explaining each dish as if they were the chef. There are different menu options for lunch and dinner. Dinner offers a slightly larger menu, but is concise leading me to believe each dish will be fresh, which they were. 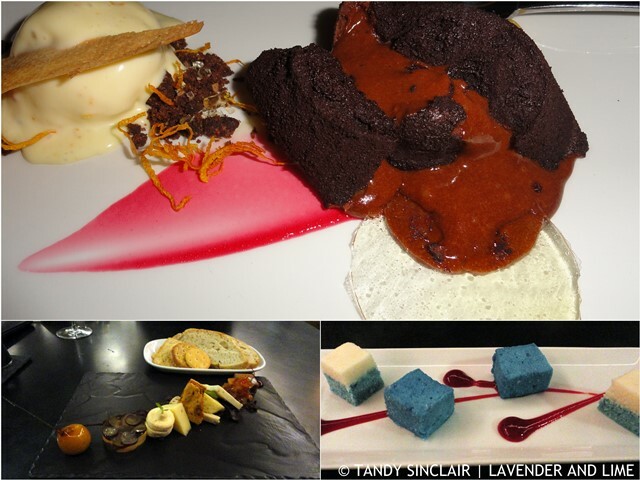 In an old school feel, there are sorbet options on offer between the starter and main courses. The selection seems very nice but we did not choose a palate cleanser. The average price of a main course is R206, and includes a vegetarian option. Once we have placed our order we are offered an option between cheese bread and focaccia. We both chose the cheese bread. The bread is served with a peppadew butter and a salt & pepper butter which emphasised the pepper. The bread was warm and my preference was for the peppadew butter. We were served an amuse bouche of baked apple purée, ham crush (which reminded me of black pudding) and seared pork which I am sure was a pork banger. The amuse bouche did not blow me away and was not at all representative of the meal to come. Dave chose the beetroot cured salmon with horseradish apple slaw and bread crisps (R100) to start. The salmon was very thinly sliced and enjoyable. 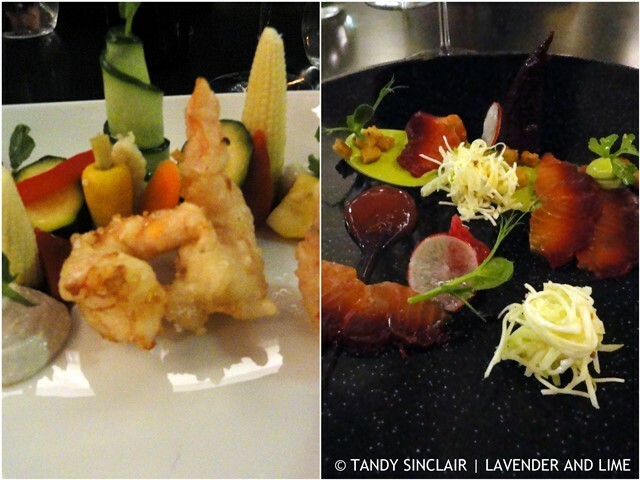 I had the tempura prawns, which were served with pickled vegetables, that were very crunchy, and sesame emulsion (R115). I did not like the black sesame emulsion but the white one was delicious, reminding me of tahini. My prawns were served warm, while the rest of the dish was cold. Dave’s main course choice was the pan fried loin of venison, which was served with parsley mash and carrot purée (R195). This would have been my choice had Dave not ordered it. I had a taste of the venison and it was divine. 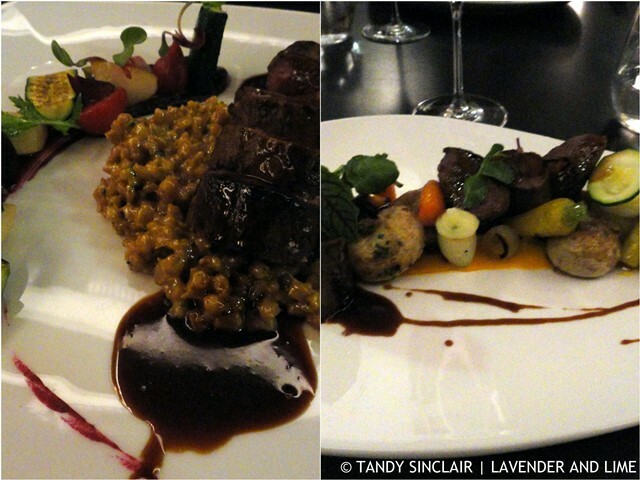 I chose the lamb loin (R240) with pearl barley, beetroot purée and roasting jus. The jus was excellent. I was not a fan of the barley as it was not cooked enough for me. This is personal and not a reflection of the chef. The plates are elegant and beautiful and Dave admits he would have licked his clean had we been at home. For dessert I had the hot chocolate fondant with orange ice cream and bitter sugar brittle (R85). It was rich and decadent as a dessert should be. Dave and I were offered coffee with the dessert course, and port with the cheese board. Dave does not have a sweet tooth and chose the Cape cheeseboard with preserves and salted breads (R125) instead of dessert. I got the feeling that they thought it was for after dessert and it was brought to the table once I had finished my fondant. The platter was generous with lovely additional items, including a toffee apple, honeycomb and grape jelly. Our meal ended with petit fours which included a sour sherbet marshmallow that was scrummy. The staff were extra attentive and we completed our visit with a conversation on single malt whisky’s with the bartender and manager. Their selection is fair and the bar looks like a great place to sit before a meal. Disclosure: Our wonderful meal was on the house, but that did not influence our opinion, which was in agreement. The meal and evening were fantastic, and worth a great review. Dinner at Dash was facilitated by Elize Engle from Wired Communications. The photographs were taken on the night and I am to blame for how dark they are. What a lovely restaurant and all the food look amazing. Sounds like you and Dave had a great evening out. Everything looks and sound quite different from anything I know here in the US, I would love to try everything. I am adventurous when it comes to food. I like to try it all. It is a shame the the setting of the place wasn’t warmer. Great review. Hi Tandy, oh the food sounds so wonderful, it is almost dinner time here and now I want what you had. Wish I could get restaurants here to invite me, especially ones like this. What a lovely evening you and Dave had, Tandy! What stood out for me was the “beetroot cured salmon with horseradish apple slaw and bread crisps” that Dave had – dang – that sounds so so good!!! I am so curious how the “beetroot curing” of the salmon happened! It sounds like a delicious meal! Great review Tandy. This experience looks absolutely enchanting Tandy! Would love to taste through my screen. The food certainly looks most beautiful, don’t mind the dark pictures at all, I can still get the gist. I would love to dine here for an anniversary or other special event. Lovely.